Begining May 14th, the people of Pulilan in Bulacan Province, San Isidro in Nueva Ecija Province, and Angono in Rizal Province celebrate for two days. On the first day, farmers pay tribute to water buffalos, known as carabaos. These animals are very important for farmers because they help till the land. Farmers brush their carabaos' skin until it is sleek and shiny. 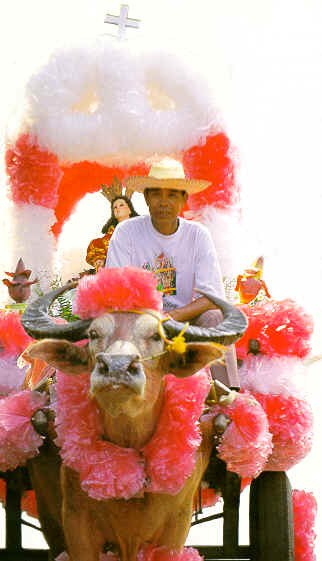 Then the carabaos are decorated with ribbons and attached to carts. 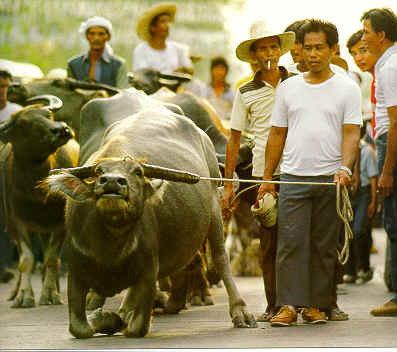 In the afternoon, farmers lead their carabaos to the church square to be part of the procession. 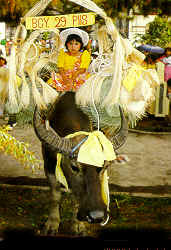 At the church, the carabaos kneel for their blessings. On the second day, the carabaos compete in a friendly race.